On June 26th, 1999 the Central Florida High Voltage (CFHV) Fast Electric Boat Club held the second annual summer SpeedFest event. 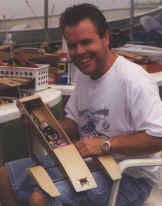 Racers traveled from all over the state to participate in this tune-up race, prior to the 1999 NAMBA Nationals. The race was held in Kissimmee, Florida at the new Lake Tivoli race site. The weather was summer typical for Florida (hot and humid) and the new site perfectly suited for a fast paced race. This is the race site for the 1999 NAMBA Nationals. The racing action was unpredictable, fast, exciting and fun for the participants. Team Rum Runner was present with the team drivers and a fresh 1999 fleet. The horn sounded and the racing began. Stock mono (N1) went first. Stock racing is a popular class at CFHV and always very competitive. Amazing little boats with $25. motors prove as exciting to watch as race. Donnie Wollard lead driver for the Rum Runner team launched his new Rum Runner prototype mono and battled with Brian "cool hand" Vega, all day. Donnie took heat one and Brian took heat two. A flip caused Donnie a DNF in heat three and he placed second to Brian in the final heat. 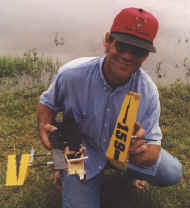 Brian¹s expertly prepared motor held off Donnie in the final heat and he was awarded first place. New member Dan Chong who drove 4 hours from Fort Lauderdale, was third for the day. Good job Dan and welcome aboard. Then went the hydro's. 6 cell modified (N2) was the first hydro class to race. This is a competitive class at our club and almost every racer had a boat in this class. The boats were as diverse as set ups and power systems. Can type 05 motors was the most popular power system used. The heats were amazing in speed for 6 cell boats. Several heats pushed 8 cell hydro speed. Team Rum Runner¹s hot little riggers showed there stuff and were very consistent in speed and handling. Chris Harris (NAMBA District 3 Director) handled the helm of club prez Tony Colarusso new Rum Runner. Tony was busy all day officiating and did not have many driving opportunities. When the spray cleared, Donnie Wollard took first place with Chris Harris nipping his heals for second. Third place went to Brian "cool hand" Vega with Don (dad) Wollard in forth position with his gear drive powered Rum Runner. Don¹s boat was as fast as any boat on the pond. He suffered a flip and two battery dumps. See! Next time he will use his new Hill Top Cells. Don looks forward to better luck and better batteries at the NATS. 8 cell (O Hydro) proved equally competitive and amazingly fast. This class raced within seconds of 12 cell hydro speed all day. The drivers choose Plettenbergs and 05's to heat the water. The Hammerhead's and Rum Runner's got down to business and went head to head. Chris Harris' perfect driving earned him a first place with Donnie Wollard in second place followed close by Rob Michael's. Both drove Plettenberg powered Rum Runner's. Dan Chong charged into forth position with his Plett powered english rigger. Just prior to this event, Rob Michael's (internationally renown R/C car racer and owner of Superior Hobbies) launched his new prototype Rum Runner rigger with Plettenberg power. This is the fastest 8 cell hydro anyone in the club had ever seen. 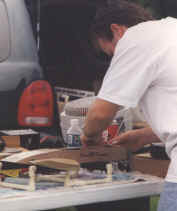 Rob had just returned from a national R/C car event which left no time to fine tune his new rigger. It is certain he will soon have his little water rocket a serious contender for NATS competition. The 12 cell Hydro "bumper boats" proved exciting and dangerous. There was 4 hammerheads, 1 Rum Runner and 1 Maus racing for points and bragging rights. The excitement of 6 fast boats neck and neck at the turn one is quite a kick. The water boiled, spray flew and boats went... well everywhere. Power systems included Plett's, Aveox and Twin geared 05's. Brian "cool hand" Vega was first with his Plett powered Hammerhead. Chris Harris's Aveox powered Hammerhead was a very close second followed by Don Wollard's dual Fantom (05's) powered Rum Runner. Tony Collorusso's new Hammerhead encountered something which did a number to his rudder. Loosing control, Tony "T-boned" the club retrieve boat at near full speed. Poor guy, finally got a chance to drive and this. WHAT ALLIGATOR!!! The East Coast "Mono Masters" Chris Harris and Brian "cool hand" Vega demonstrated there 12 cell mono skills with expertly prepared Maus bullets. Only two boats made the start so the race was for practice only. The Neck and neck racing of these two pro¹s was breath taking. Chris Harris took heat one with an unofficial time of 54.75 seconds. Whoa! Congrats to Chris. Brian proclaimed, "The Nats belong to me!". Special thanks to Chris Harris and Tony Collarusso for putting on another great event. I know everyone is looking forward to there hospitality at the NAMBA Nationals in September. ONLY ONE MONTH UNTIL THE REGISTRATION DEADLINE. If you have not yet registered for the 1999 NAMBA Fast Electric Nationals, now is the time. 200 plus boats will race at this 3 day event. Come join the festivities, racing and friendships of this final NAMBA fast electric event of the century.